2.5B people in the world have poor vision that is uncorrected. ​Eye wear can solve 80% of those cases. $3T is lost productivity globally. China suffers from a vision crisis of epidemic proportions. 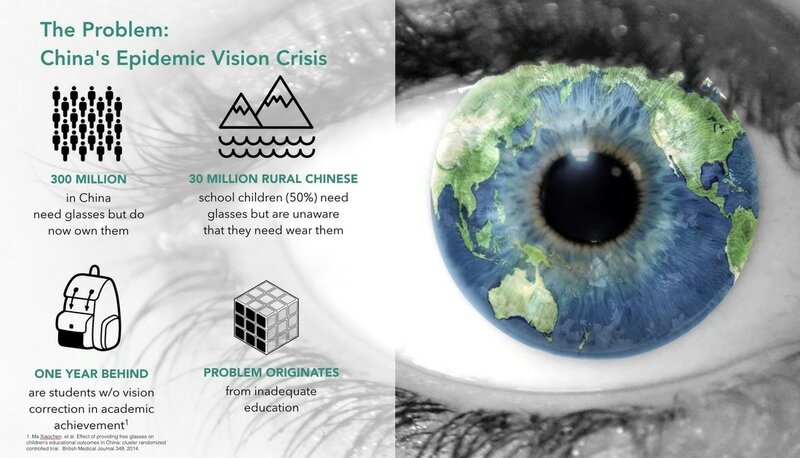 300 million rural Chinese, including 30 million schoolchildren, need eyeglasses. ​Studies by Stanford University and Chinese governmental agencies of 1,000 schools in seven provinces quantified a high prevalence (>25-70%) of refractive error in rural students but rare spectacle wear (only 16% in nearsighted children). These studies also proved that eyeglasses not only improve the welfare of children, but also led to extraordinary (>20%) gains in school performance. As education is increasingly critical to succeed in Chinese society, correcting myopia plays a key role in extending opportunity to China’s rural youth, a vast and struggling segment of China’s population. ​Smart Focus’s founders’ years of groundwork, commended by the Chinese national government, have catalyzed sweeping education and healthcare policy changes impacting 100 million people in the provinces of Shaanxi and Gansu. ​thriving at the intersection of between industry, government, and universities. partnerships (at) smartfocusvision (dot) com. Copyright © 2017 Smart Focus Inc. All Rights Reserved.